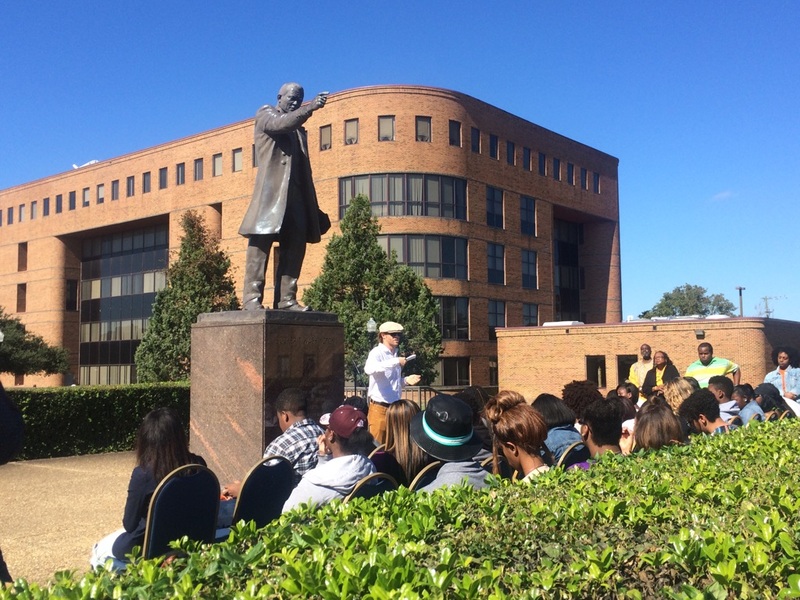 On October 11, students and faculty at Hampton University celebrated the second annual Booker T. Washington Day. Various people gathered at the Booker T. Washington monument located on Hampton University’s campus to commemorate the life and values of the one of the institution’s most notable alumni. Booker T. Washington graduated from Hampton University, then known as Hampton Normal and Agricultural Institute, in 1875. Washington later served as an instructor at Hampton. In 1881, Washington founded Tuskegee Normal and Industrial Institute, now known as Tuskegee University. Booker T. Washington Day was established to counter Christopher Columbus Day. Throughout the United States, groups are criticizing the acknowledgement of Columbus Day as a national holiday. To some, Christopher Columbus Day is used to celebrate Italian-American heritage and Columbus’ landing in the New World. Others see the day as disrespectful, citing the Native American genocides that are associated with Columbus’ arrival to new land. Many groups have turned to celebrating Indigenous Peoples’ Day. Hampton University students and staff decided to observe Booker T. Washington Day in solidarity with Indigenous Peoples’ Day. Leah Smith, a senior history major from Hampton, Virginia, hosted the event. Smith also serves as the vice president for Hampton University’s Phi Alpha Theta chapter. “This day means a new beginning in myself and others, to make an impact on society the leaves behind the legacy that Booker T. Washington did,” said Smith. Professors from Hampton University’s history department spoke on Booker T. Washington’s legacy in education and the advancement of African Americans. Dr. Zachary McKiernan addressed the purposes of the Booker T. Washington Day. Students were given the opportunity to share their thoughts and opinions during the event. Dr. Eric Claville closed the gathering by speaking about Booker T. Washington’s ideologies. Washington believed that in order for Black people to succeed and prosper, they needed adequate education, economic stability, and image awareness. Hampton University history professors and members of Phi Alpha Theta are preparing to make next year’s Booker T. Washington Day larger than the last. “It’s in the students’ hands to make this day as big as they want,” said McKiernan about the preparations. McKiernan along with other history professors are hoping to reach new heights with Booker T. Washington Day one student at a time.